More than 10,000 teachers dressed in red and holding placards met at Melbourne's Hisense Arena today and marched to Parliament House, in what the Australian Education Union (AEU) said was the largest strike action in the state's history. 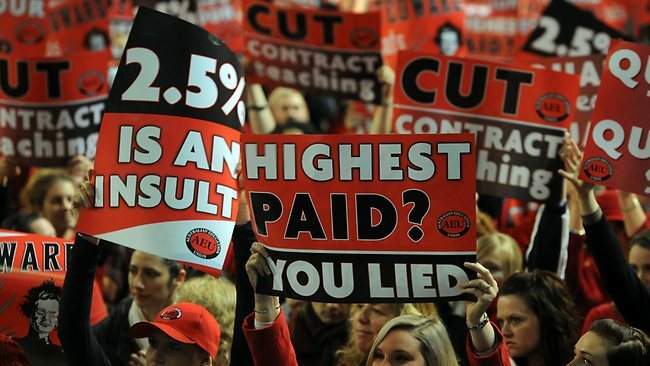 They are angry Premier Ted Baillieu has failed to honour his pre-election promise that Victorian teachers would be the nation's best paid. Instead, the Government has offered to make 30 per cent of them the the highest paid within their level in Australia. AEU Victoria president Mary Bluett said as many as 30,000 teachers across Victoria walked off the job and more than 150 schools closed today. 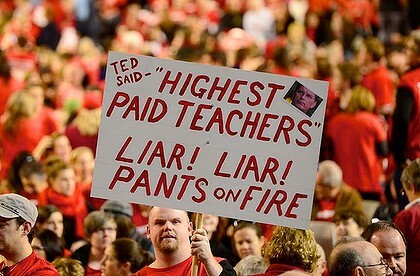 Teachers were steeling themselves for a long campaign, with further strike action likely in the third term, she said. "They are very determined. They are preparing for a long and strategic campaign and committing themselves totally to that campaign for however long it takes,'' she told reporters. Educators rejected performance pay, as teaching was a collaborative profession and overseas evidence suggested in many cases it worsens student outcomes, Ms Bluett said. "You reject it, it won't happen - nadda, never,'' she told the cheering crowd. The union wants a 30 per cent pay rise over three years for teachers and support staff and a reduction in the number of teachers on contracts. Minister for the Teaching Profession Peter Hall said 30 per cent of teachers would be the best paid within their category when compared with interstate colleagues. He said under the Government's offer, teachers' salary range would span from $62,000 for graduates to $103,000.